BREATHTAKING VIEWS and COMPLETELY REMODELED 2/2 WATERFRONT home that easily accommodates 2 vehicles as well as a golf cart. All new Stainless Steel Appliances (2016), New Refrigerator (2017), new Water Heater (2017), New cabinets with soft close in both kitchen and bathrooms (2017), New Vinyl Siding (2017), newer double pain windows throughout home except Florida Room because they were replaced prior to current seller owning, HVAC (2010),metal roof, and New pavers (2017). Enjoy waking up to beautiful sun rises, then Walk down to your own dock with boat lift, jump in a boat and spend the day on the Chain of Lakes. Then go to one of the many dock side restaurants for lunch and after that watch the moon shine across the lake and fish off your own dock. Waterviews, sunsets and sunrises can be enjoyed from several rooms -dining room, living room and enclosed lanai! Get ready to enjoy being RIGHT on LAKE GRIFFIN-THE CHAIN OF LAKES while just being 10 minutes from The Villages, shopping, restaurants and grocery stores. 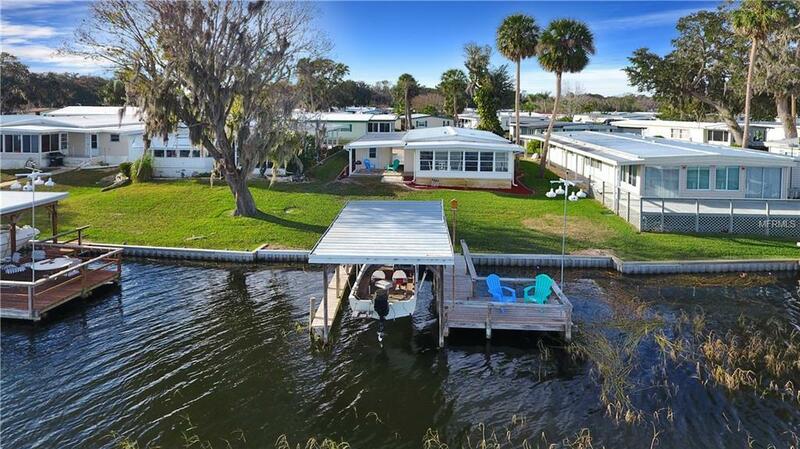 This home has LAMINATE and TILE floors AND ITS OWN BOAT DOCK WITH ELECTRIC LIFT. LOCATED IN A RESIDENT OWNED 55+ MOBILE HOME COMMUNITY WITH LOTS OF ACTIVITIES, swimming pool, hot tub, shuffleboard court, and a large clubhouse.HAVE BOAT SLIPS, MARINA AND A SMALL RV PARK THAT HELPS KEEP OUR MAINTENANCE FEE DOWN LOW. Great community where the $125 monthly HOA fee INCLUDES water, sewer, trash pickup, lawn mowing, community pool and more!